Andy Friend’s men survived a nervy finish, brought on by Jason Harries’ 79th-minute try, as they booked their Champions Cup spot and a PRO14 quarter-final trip to provincial rivals Ulster as the result guarantees them a third place finish in Conference A. 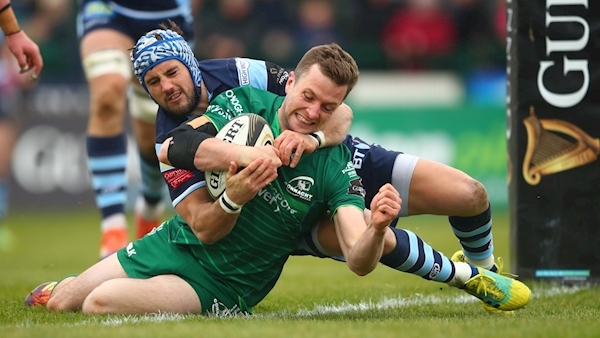 A tense and closely-fought first half ended 14-7 in Connacht’s favour, the wind-backed home side striking for tries from Caolin Blade (11 minutes) and Gavin Thornbury (26) either side of a well-taken Owen Lane effort for Gareth Anscombe’s Blues. Ireland fly-half Carty sparked a crucial 10-point surge on the restart with a sparkling team try and although Cardiff eventually restored the seven-point deficit thanks to an Anscombe penalty and Josh Turnbull’s 70th-minute try, an opportunist score by Matt Healy from the restart ultimately proved enough to ensure European top tier rugby in Galway next season. Just four points behind Connacht in the table before kick-off, Cardiff won the toss and elected to play into the stiff wind. Having watched Carty miss a penalty, the Blues got no reward for a promising multi-phase attack which saw Matthew Morgan and Willis Halaholo stretch Connacht out wide before Tom Farrell forced a penalty at ruck time. The hosts’ first serious attack resulted in the opening try, Paul Boyle bursting clean through and offloading slickly for scrum-half Blade to snipe over close to the the posts. TMO Ken Henley-Willis ruled out any offside or forward pass and Carty comfortably converted, also impressing a few phases later with a superb kick pass out to Healy. The Welshmen entered the second quarter on level terms, looking the sharper with ball in hand and big winger Lane exploited a gap on Darragh Leader’s inside shoulder to dart in under the posts. Anscombe made it seven points apiece but Connacht were clinical from limited opportunities, blindside Boyle winning a turnover penalty and claiming the line-out ball which Thornbury turned into a maul try in the right corner. Carty swept over a terrific touchline conversion before missing a long-range 33rd-minute penalty, Dave Heffernan setting up the chance with a muscular carry. Josh Turnbull and Seb Davies’ expert maul defence ensured the gap remained at seven points for half-time – but it was all Connacht at the start of the second period despite facing into the elements. Poor discipline from the Blues allowed Carty to score a 12-metre penalty, before the Athlone man scored one of the tries of the season. The attack from deep began with Leader’s quickly-taken line-out, Bundee Aki’s brilliant hands and Healy’s great pace driving their team forward before Carty cruised through a gap and collected his own kick through to touch down ahead of Morgan. 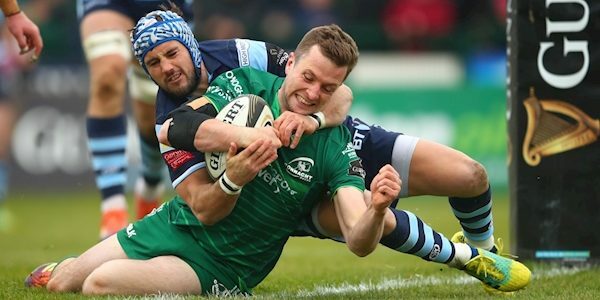 Anscombe cancelled out some of the damage with a quick penalty for a 24-10 scoreline and Connacht were fortunate to avoid conceding a try to Harries on the hour. The outcome of a TMO review ruled that he had simultaneously grazed the touchline in the act of scoring, leaving referee Mike Adamson to award an attacking scrum. Connacht were on the cusp of a yellow card when a bout of forward ended with Turnbull driving over in the left corner. Anscombe’s excellent conversion made it 24-17 but all the good work was undone when the westerners disrupted at the restart, the loose ball forcing Lane back near his try-line and it went loose again for Healy to gleefully steal in and score by the corner flag with TMO confirmation. Carty was wayward with the extras before Cardiff again showed their battling qualities, working the ball wide for winger Harries to deservedly reach over. Anscombe’s drop-kicked conversion missed the target, and although a late penalty brought the Blues back into Connacht territory, Friend’s charges won a final turnover for Blade to kick the ball dead.